What has become an annual event has happened again with yet another exit from the League Cup at the hands of a lower division team. It was Burton Albion this time, beating us 2-1 last night, to add to Sheffield Wednesday, Port Vale, Accrington Stanley and Leeds United who have all beaten us in this competition since 2014 with the only solitary success that 2-0 win against Blackburn Rovers at Ewood just over a year ago. This was a night of sheer frustration, of another very disappointing Burnley performance yet one from which we really should have earned our way into the 4th round for the first time since the 2013/14 season. We even managed to get a lead in the first half but once Burton had equalised out of the blue it all had that feeling of inevitability about it. I wasn’t sure what to expect from the Pirelli Stadium to be honest, but it was smaller than I imagined and they certainly didn’t have to pack us in. The attendance of 2,449 was the smallest we’ve played in front of in this competition since the penalty shoot out win at Grimsby eleven years ago. As is always the case, Sean Dyche opted to make numerous changes. Two years ago it was ten at Accrington, last night it was six but when you looked at the players coming in, it hardly suggested we were weakening the team. No matter who was and who wasn’t on the team sheet, one name clearly met with the approval of the travelling fans and that was Steven Defour who was in the team for the first time since the home game against Manchester United just over eight months ago. Tom Heaton, Kevin Long, Stephen Ward, Dwight McNeil and Chris Wood were the other five to come in to a team that really should have been too strong against what proved to be a very average looking League One side. It was a strange first half. We had a lot of the play, had two goals disallowed, scored by Wood and Long, while Wood shot just wide after a ball in from the left. Burton too had their moments with Heaton in just the right place, thankfully, to make a save, but the whole first half was interrupted constantly by a referee who seemed to have absolutely no intention of allowing the play to flow. Defour was certainly an influential figure on the pitch. He’d done some great defensive work, had hardly given the ball away and it was he who set up the two efforts that were, rightly I believe, flagged offside. Long wasn’t to be denied his goal though. In the very next attack after he’d seen his goal chalked out, we won a corner on the left and he met Jόhann Berg Guðmundsson’s kick with a towering header to give us the lead. That’s Long’s third goal for Burnley and all in different competitions. His first was back in 2014 in the FA Cup and last season he headed home his first ever league goal for us in the 2-1 win against Leicester. With a one goal lead at half time we looked comfortable and so we should have, and it could have been game over had Guðmundsson scored in the second half. He saw his effort well saved by Dimitar Evtimov but he really shouldn’t have given him any chance. Soon after it was all square when Liam Boyce scored for Burton and, for a time, I thought we might be taken to a penalty shoot out by the home side. We made three changes and the first of them saw Ashley Barnes come on. Within no time he’d hit the post, set up another chance, and then Wood saw an effort saved. Burton brought on ex-Claret Marvin Sordell. He’s bravely opened up recently about his depression and he received an ovation from the Burnley supporters when he came on. Two minutes later he was helping Burton celebrate the winner. Embed from Getty ImagesWe pushed men forward to try and get back into it but the closest we got to another goal was when Burton broke and hit the woodwork. The final whistle couldn’t come soon enough and when it did there was some real frustration showed by Burnley supporters on the terracing. After a disappointing start to the season we beat Bournemouth 4-0 last Saturday and there was a real feel good factor around the place. It had certainly disappeared by the time that final whistle blew last night. This was another embarrassing League Cup defeat and, overall, another unacceptable performance in this competition. Good luck to Burton but I doubt they’ll find any other Premier League club so easy to get past should they draw another from the top flight in the next round. That’s it then, out again before we’ve even got warmed up. At least it saves me tuning in to Saturday night’s fourth round draw. 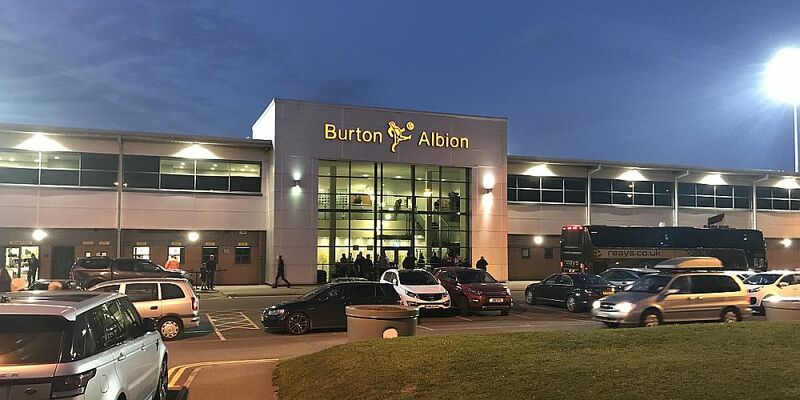 Burton: Dimitar Evtimov, John Brayford, Jamie Allen, Ben Turner, Scott Fraser (Joe Sbarra 77), Jake Hesketh, Lucas Akins, David Templeton (Marvin Sordell 81), Damien McCrory, Stephen Quinn (Ben Fox 69), Liam Boyce. Subs: Harry Campbell, William Miller, Reece Hutchinson, Jake Flannigan. Burnley: Tom Heaton, Matt Lowton, Kevin Long, Ben Mee, Stephen Ward, Jόhann Berg Guðmundsson, Ashley Westwood, Steven Defour (Jeff Hendrick 74), Dwight McNeil, Matěj Vydra (Ashley Barnes 71), Chris Wood (Sam Vokes 81). Subs not used: Adam Legzdins, Phil Bardsley, Charlie Taylor, Aaron Lennon.